The light tackle marlin fishing action has been slower than usual this year. Regular anglers Lee and Josh Shardlow joined me for 3 days in early September. We spent the first day looking for a small black or sail inside the reef with no joy, though plenty of mackerel action and some GT’s on poppers late in the day. The following day we headed outside to the Shelf and fished our way North to Lindenbank. The trolling was slow but the jigging was excellent, though the score certainly favoured the dogtooth more than they did Josh (a jig sponsor would come in handy!). The conditions on the Bank looked excellent with strong South current & good water temperature (25.8 degrees). My next September trip was with Greg, Arthur & Kim Laidler, from 8-10 Sep. We fished offshore around Lindenbank once again and had great fishing for mackerel, wahoo, yellowfin tuna, dolphin fish and had a bite from a marlin around 200lbs. The weather was excellent 5-10 knots providing superb reef conditions for a first time Cairns fishing trip for the Laidlers’. From the 11th to the 13th, we fished heavy tackle with keen anglers Renee, Carlos and Memo from Mexico. The weather first day was ideal around 10-15 knots with the strong current still pushing South. The Bank was loaded with bait, scad, runners, skipjacks and yellowfin and all looked set to fire. 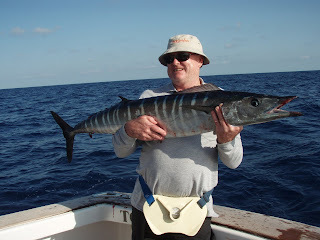 First day, no bites from a marlin but we kept the boys busy with some nice wahoo and yellowfin. With the wind blowing up the next day to 20-25 knots – rough conditions had the guys wondering, do we really fish in this stuff?? That afternoon we caught a black around 200lbs, lost another one just out of leader reach – possibly around 180lbs and then at the end of the day, jumped off a small fish around 120lbs on a lure. They’re here!! On the final day we had 1 bite at the top of the Bank, but no hook up before fishing our way South for the run home. With 2 days off now to load the boat and restore, I am looking forward to fly fishing with old time client and friend, Mr Ishikawa for 4 days.